Bins are incredibly important in the modern day and age and they can be effective at dispensing of rubbish. However, bins can also be unhygienic and it can therefore be important to choose a bin that has a functional way of avoiding the spread of germs. In this review we will take a look at the best touch less kitchen waste bins that are currently available and we will also outline the benefits of these bins so that you can choose the one that you desire. As soon as you touch the bin there is a high chance of spreading germs or picking up germs. If you are carrying something across to the bin you need to touch it to lift the lid, the lid maybe covered in bacteria and horrible germs so each time you should wash your hands with soap. With a touch free bin there is no need as you don’t actually touch the bin, this means you bin stays cleaner and safer for your family. Some kitchen bins work by foot pedal, however most are just lift up flap lids. With this, some people may forget to close the lid, or maybe about to go to the bin again so they leave it up, however with it left up awful smells can creep out, keeping the bin lid is closed while not in use also keeps the germs and odours inside the bin where they belong! A touch free bin automatically closes as well as opens, so you don’t need to worry about who left the bin lid open. A touch free bin means that there is less bacteria and germs around the lid, and there are also no finger prints as there is no need to touch it. If you want a stylish stainless steel bin then an automatic version is the way to go and becoming increasingly popular. If you would like more information concerning the bins that are on offer in this set of reviews, simply click through and you will be able to get more information about these bins on the Amazon website. 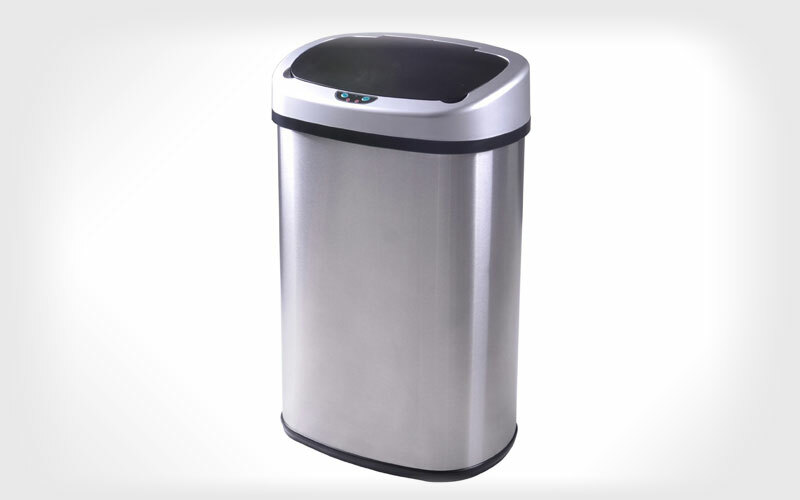 The Nine Stars DZT-50-9 Infrared Touch less Stainless Steel Trash Can has the ability to seal any odors and will eliminate any cross contamination that takes places with germs. It does this by allowing an operation that is touch free and will hold a huge 13.2 Gallons. The bin it’s also made from stainless steel of a very high quality and this will stop any dirty fingerprints from getting on the bin. The bin is great for the bedroom and the living room in the modern house and can also be used effectively in an office environment, as well as in the kitchen. 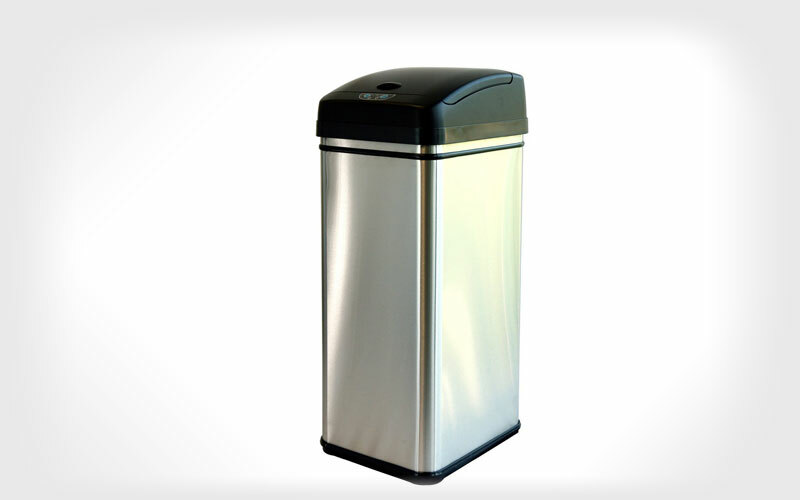 The bin also has technology that allows for energy saving and this will keep the battery life longer for up to 20%. The bin also features a ring for the garbage bag and this will keep it hidden from view. 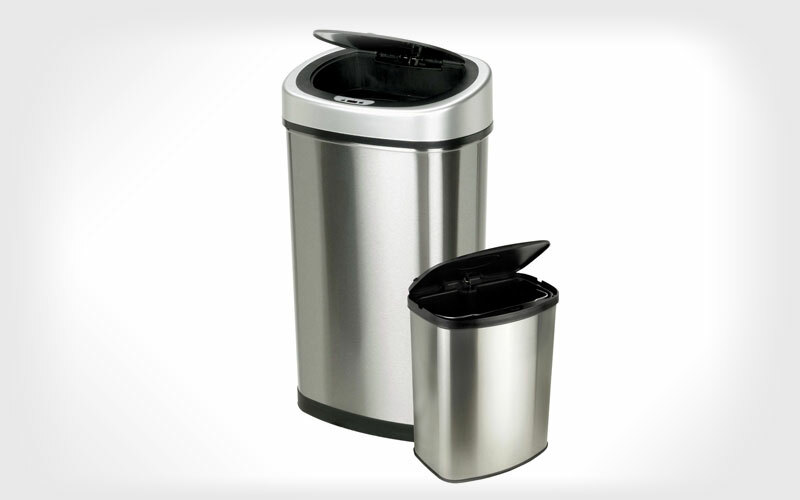 With over 2,000 reviews and a 4 star rating on Amazon it is hard to ignore this touch less bin. Another popular choice is the iTouchless Deodorizer Touch-Free Sensor 13-Gallon Automatic Stainless-Steel Trash Can, with over 3,000 reviews and a 4 star rating on Amazon too it is another very popular choice. This bin comes with a carbon deodorizer and this is a refill that is sold separately. The bin has an opening that is extra wide and this will allow for larger amounts of debris. The bin also is equipped with holes that allow air to escape and this will increase the ease when removing the trash bags. The bin is powered by four batteries and also has an AC power adapter that is optional. The bin is designed with hygienic features so you do not need to touch it. You can therefore use it effectively in locations such as elderly homes. This set of bins contains two trash cans that have a touch less functionality and will see away odors in the bin when it is used. It is also designed to eliminate any cross contamination that can take place. The bin also has a design of stainless steel on the sides and this will allow for any fingerprints to be avoided. The bin has also been designed with plastic tops in a stylish black design. There is a water resistant motion sensor that is infrared and this sits on the top of the bin so that it can be activated when you want to throw stuff away. The bin also runs on four batteries and the larger one can run on three or four batteries. The bin has been designed with technology that is energy saving. 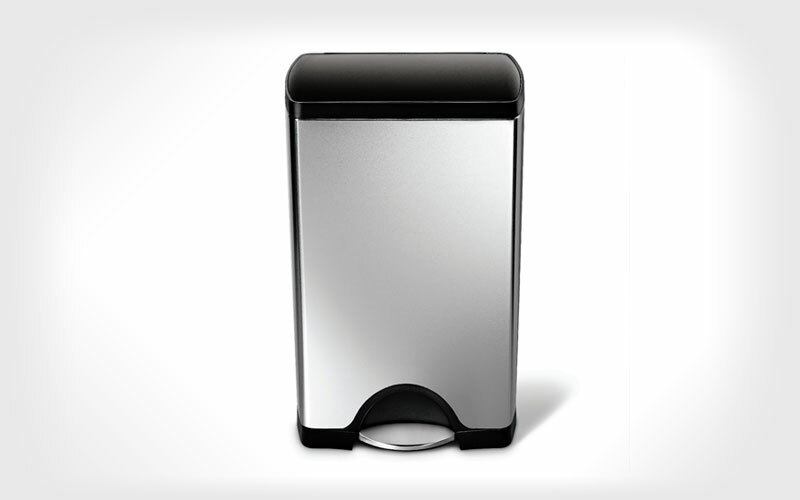 This bin is made from high-quality stainless steel that will avoid any smudges or fingerprints when it is used. The bin is also relatively large and can hold up to 13 gallons of waste. The bin has been designed with a button that will switch it on and off, and also has an open and close button for when you want the bin to be open whilst you’re throwing trash away. This bin has been designed for many different locations, and this includes the kitchen as well as the office and rooms around the home, such as the bedroom and the living room areas. 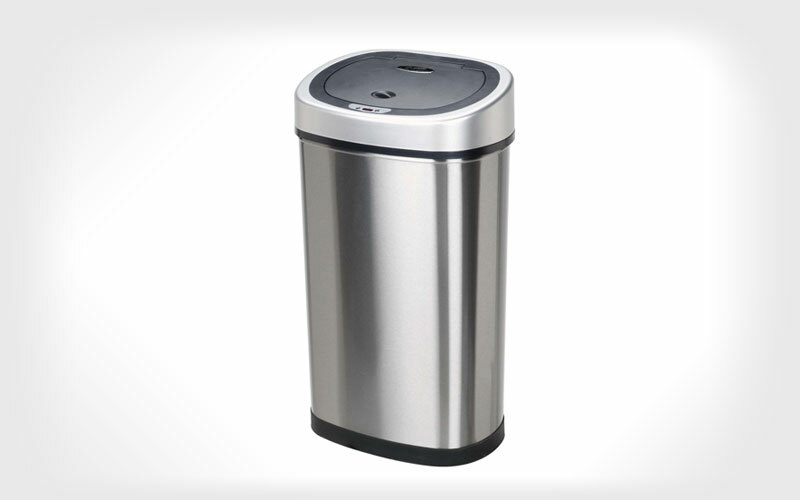 This sleek and stylish pedal bin offers a strong steel exterior. The bin also has technology and this will allow for a silent and Smooth closing operation. There is also a lid on the bin which offers a plastic damp proof design and there are hinges which are built internally into the bin that will allow for the ability to place the bin against a wall space. This bin will come with a warranty that lasts for up to 5 years and is available for custom fit lining and this will allow for the ability of a perfectly fitted bin liner when it is placed into the bin.